Siddal won 12-6 away to Brighouse Rangers in a thrilling Pennine League Championship derby clash on Saturday. Darren Phillips’ young visiting side, needing points to climb away from the lower reaches of the table, were completing a double after a 24-12 win over Rangers at the end of November. The visitors opened the scoring with a converted try early on, after a spilled ball and excessive vigour in the tackle had earned them a penalty and good field position. Brighouse quickly hit back with a beautiful try from Joe Campbell in the corner from distance, crisp passing and incisive running creating the opportunity. Frankland’s goal from the touchline levelled the score and the sides remained in an arm wrestle to go into the break at 6-6. The second half was end to end, both sides being stopped inches short on several occasions. The ferocity of the Brighouse defence was starting to take its toll on Siddal with Sam Moon and Andy Esmond making their presence felt. Brighouse were turning the screw but just couldn’t get over the line due to excellent scrambling defence from Siddal. 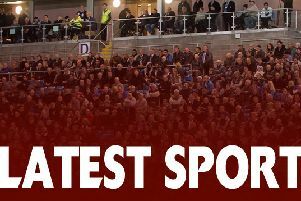 Rangers were dominating field position but five minutes from time, Siddal’s full back delivered a killer blow with a break from his own 40 metre mark, outstripping the host defenders for pace, sending the visiting players and fans into raptures. The conversion made it 6-12, but Rangers weren’t done yet. With two minutes remaining, a break down the left presented Anton Ambler with a chance to finish in the corner. He got over the line but four Siddal defenders bundled him over the dead ball line. Siddal then shut the game down with safety first rugby to see out the game. Despite the loss, the Rangers players can take great credit from the game. Wrightson was an absolute workhorse and Lewis Taylor on the wing proved he can pose a threat from anywhere. They all gave 100 per cent but just couldn’t cross the whitewash. Brighouse are back in action on Wednesday when they visit Keighley reserves for a friendly. Ovenden will play Lock Lane in the final of the Bartlett’s Yorkshire Cup at Featherstone on Saturday, January 20. The Castleford side beat East Leeds 32-10 in Saturday’s delayed second semi-final. Ovenden, who beat Hull Premier Division leaders North Hull Knights 34-14 in the snow at Four Fields before Christmas, suffered a first Pennine League defeat of the season at the weekend when they lost 20-8 at Sharlston Rovers. BARLA Bartlett’s Yorkshire Cup, semi final: Lock Lane 32 East Leeds 10. Pennine League Championship: Upton 48 Illingworth 20, Brighouse Rangers 6 Siddal 12, Queens v Ossett Trinity P, Sharlston Rovers 20 Ovenden 8. Division Two West: Ovenden A 8 Hanging Heaton 40, Hollinwood 16 Underbank Rangers 46, West Craven Warriors 8 Moldgreen 26, King Cross Park 62 Cowling Harlequins 0. Division Two Central: Wortley Dragons v Wakefield City P, Queensbury 60 Beeston Broncos 4, Clayton v Eastmoor Dragons P, Oulton Raiders v Wyke P, Birkenshaw Blue Dogs v Woodhouse Warriors P.
Division Two East: Dearne Valley Bulldogs 40 Featherstone Lions 14, Moorends Thorne 30 Upton A 0 (walkover), Methley Warriors v Kinsley Hotel Raiders P, Selby Warriors v Doncaster Toll Bar P, Kippax Welfare 11 Allerton Bywater 12.